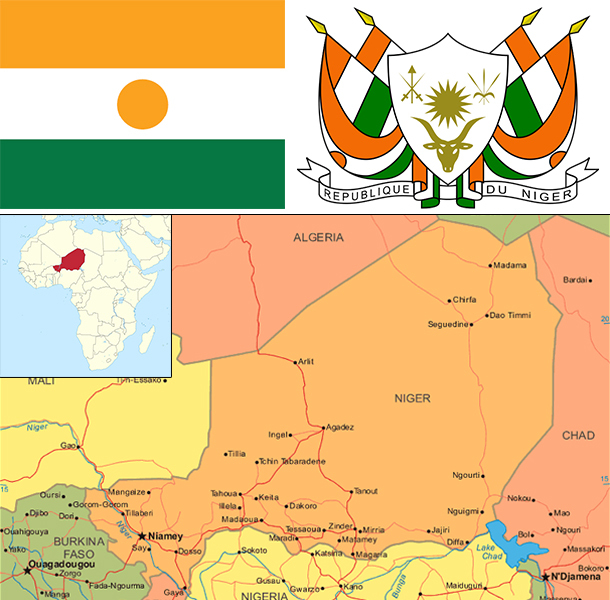 Niger is a landlocked, sub-Saharan nation, whose economy centers on subsistence crops, livestock, and some of the world's largest uranium deposits. Agriculture contributes nearly 40% of GDP and provides livelihood for most of the population. The UN ranked Niger as the least developed country in the world in 2014 due to multiple factors such as food insecurity, lack of industry, high population growth, a weak educational sector, and few prospects for work outside of subsistence farming and herding. Since 2011 public debt has increased in part from a large loan financing a new uranium mine. The government relies on foreign donor resources for a large portion of its fiscal budget. The economy in recent years has been hurt by terrorist activity and kidnappings near its uranium mines and instability in Mali, and concerns about security have boosted fiscal spending on defense. Future growth may be sustained by exploitation of oil, gold, coal, and other mineral resources. Niger has sizable reserves of oil and oil production. Food insecurity and drought remain perennial problems for Niger, and the government plans to invest more in the agriculture sector, most notably irrigation. The mining sector may be affected by the government’s attempt to renegotiate extraction rights contracts to increase royalty rates and reduce tax exemptions. Despite Niger’s three-year $121 million IMF Extended Credit Facility agreement for years 2012-15, formal private sector investment needed for economic diversification and growth remains a challenge, given the country’s limited domestic markets, access to credit, and competitiveness.